MacBooks to get glowing touchpads? The Apple patent application shows how an iPod-style click wheel may be added to MacBooks in the future. Imagine having the current time, or a list of new emails in your inbox, constantly glowing on your MacBook's touchpad. This feature may be on its way, according to a new Apple patent application . The unearthed Apple patent reveals plans to add illuminated touchpads to its Apple MacBook notebook computers. The proposed constant visual feedback would improve the overall user experience of certain products, Apple stated in the patent application. The patent was submitted to the US Patent and Trademark Office earlier this month. It states that the touchpad is an "illuminated input device comprising: an object sensing mechanism capable of sensing a user input over an input surface; and a visual feedback system configured to illuminate the input surface in association with a user input." In other words, the area where the touchpad is currently located could be transformed into a glowing touch panel that can identity what's touching it, where the object is touching it, and how. The light could also be used to display your email inbox or current iTunes track, according to AppleInsider . "Moreover, the touchpad may be used as a timer or clock. In the case of a clock, the touchpad may include segments corresponding to the position of a clock, and the segments can be illuminated in a controlled manner to indicate the current time," the patent states. 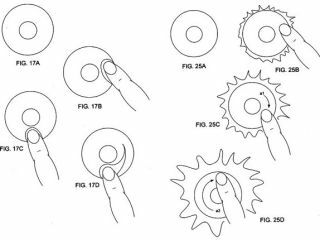 Of course, there's no guarantee that this patent will ever end up in any Apple product. But it does sound pretty cool.